Lindsay Sterling’s niece has gone missing in the New York underground and the cops do nothing except pass along a name. Jack Cole. Twenty years ago they were good buddies but horrors have changed them both. Lindsay lost her entire family except for her niece in a car accident, and Jack was held captive in New York’s underbelly for nearly two years by demented sub-humans. It was a soul-sucking experience that’s left him a shell of a man. He refuses to descend into that hell again, especially for a girl who’s probably dead anyway. But when Lindsay is nearly killed there after going it alone, Jack feels compelled to save her skin. Jack navigates Lindsay through a strange territory, populated with the eccentric, the insane and the desperate. Each encounter takes them closer to Lindsay’s niece but also closer into the clutches of the mad creatures that will enslave them. 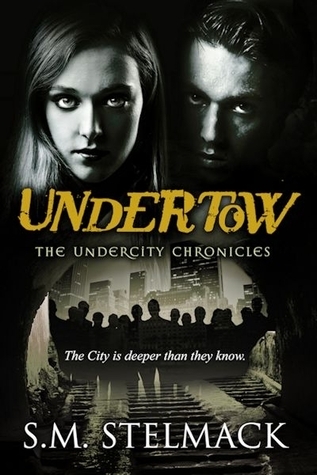 Undertow, is a story that takes place below New York City. It starts out with to teenagers Jack Cole and Lindsay, he takes her in a tunnel that his father is working on below New York. She found out he enjoyed searching the tunnels under ground even when they found something that was disturbing he still enjoyed going underground. Now 13 years later she is looking for her niece who had been going in the tunnels to help the homeless but she has been missing for months now. Lindsay goes back to the New York police captain who she filed the missing persons report with and explains her plight. That she cannot find anyone to go into the tunnels to search for her niece. The captain understands but tells her they don’t even go underground because of the danger to the officers and that there is not any maps to go by. So he gives her a card with a name on it and it has his name on it Dr. Jack Cole, she had seen that name in years and when she started to think back she remembered that he went missing for two years after going into the underground of New York and then one day he just appears. Shocked a lot of people but since then he had lost his teaching job and she did not know what had become of him. When she does find she is shocked by his appearance, and where is living. She starts to talk to him about looking for her niece and at first he turns her down. It is not until the next day and then she works on trying to bring out of him what happened to him though two years he was gone underground and trying to bring him back to the living, while still finding her niece. I found this to be a good story really better than I thought. It does not all take place underground but the way the author brings the top world with the bottom is really good and bringing their relationship or friendship back is good as well. The mixing of two worlds was really a better story than I could even imagination. A very good book. I got this book from net galley.